As they prepare to move to the Olympic Stadium, bidding farewell to their beloved Boleyn Ground after 112 years, West Ham fans want Napoli’s Gonzalo Higuain as the man to fire them into a new era under the helm of Slaven Bilic, according to our latest poll. The Hammers were one of the stars of last season, claiming a record points total and a first ever positive goal difference. Players such as Dimitri Payet starred in the claret and blue, and now Hammers fans are hoping hitman Higuain will join the French winger. 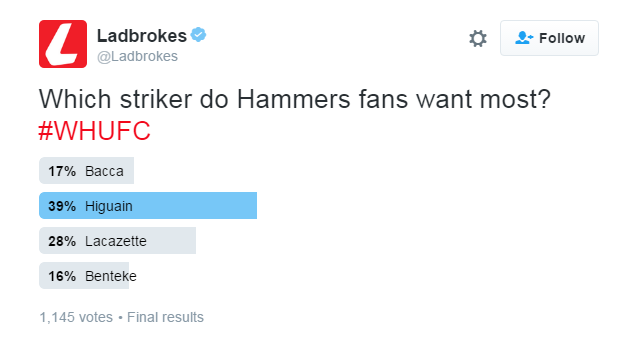 With a host of big-name strikers linked with a move to east London this summer, we put West Ham fans on the spot with today’s poll, asking who do they want most of all? Higuain came home rather comfortably as Hammers’ first choice, with 39 per cent of the vote, and having scored a stunning 36 goals in just 35 Serie A games last season, it’s little wonder why the Argentine is so popular. Lyon’s Alexandre Lacazette came second with 28 per cent, leaving Carlos Bacca and Christian Benteke battling to avoid the wooden spoon. The Hammers begin their campaign with a tasty-looking tie away at Chelsea, where Antonio Conte will begin a new era with the Blues. It’s 5/1 Bilic’s boys spoil Conte’s welcoming with three points, with the Blues 8/13 to launch their own title challenge victoriously. Meanwhile it’s 7/1 the east Londoners bag themselves a top four spot next term, odds which would surely shorten if they can welcome Higuain to the Olympic Stadium.